We often reiterate on our website that ground is usually not level, even when it appears to be. 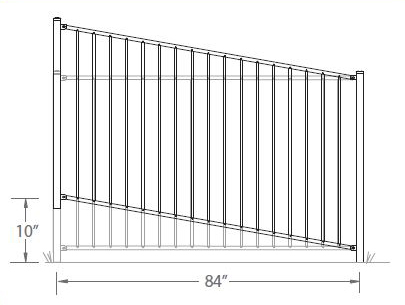 Our aluminum fence is engineered to handle fairly significant slopes of up to 10in over the course of one 84in panel. This means that your aluminum fence can slope with the contours of your yard, which is often the desired look for aluminum fencing. There is nothing special you need to do to rack your aluminum fence once you have assembled it. It will angle or rack to the position you set it.